If you live in Malta or any one of the 17 Eurozone countries, you may have noticed a newcomer in your wallet since May 2013. Or, like myself, you may not have. As someone who lived through the UK’s momentous changeover to decimal currency in 1971 and then Malta’s change to the Euro on 1 Jan, 2008, it’s strange to think that there are children, now aged 11 like my son, who’ve only ever known the face of Europa. I hazard a guess that only bank tellers have clocked the latest note change even though around 332 million of us use it daily. This post is of the practical advisory type to help visitors and residents of Malta get to know their notes well, not just to spot fraudulent ones, but also to help them when they delve into purses and wallets. Since May, a new-design Euro fiver appeared; the first and lowest denomination new-look Euro note to be in circulation as part of an ongoing programme over the next few years to replace Euro bank notes. Wear and tear of old notes and replacement with smooth, sleek new notes apart, there practical reasons for the change. The new €5 banknote has benefited from advances in banknote technology since the first series was introduced in 2002. It includes some new and enhanced security features. 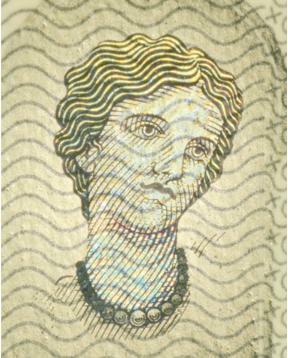 The watermark and hologram display a portrait of Europa, a figure from Greek mythology – and hence the name of this series of banknotes. An eye-catching “emerald number” changes colour from emerald green to deep blue and displays an effect of the light that moves up and down. All these security features can be found on the front side of the new note and can be readily checked using the “feel, look and tilt” method [see videos above for how]. It is envisaged that they will be included in all the banknotes of the Europa series. The other banknotes in the series will be introduced in the years ahead, with the €10 as the next denomination.